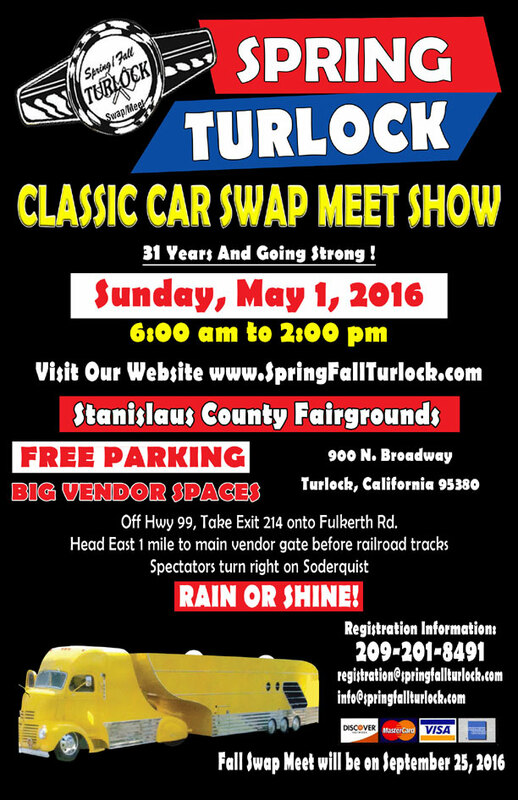 Mark your calendars for the upcoming Spring Turlock Swap Meet! Sunday, May 1st 2016. Your application to purchase / reserve vendor space(s) constitutes an express contractual agreement that you agree to all rules, regulations, terms, and conditions as set forth by the Spring Fall Turlock Swap Meet, and that you agree to release Spring Fall Turlock Swap Meet, it's Owners and Staff, The State of California, and Stanislaus County California, from any and all liability related to damage, theft, loss of property and / or personal injury that may occur either directly or indirectly, as a result of your attendance of and participation in the Spring Fall Turlock Swap Meet.